I know after an evening out, and coming in quite late that the last thing I want to be thinking about is skincare; or even taking off my makeup for that matter. I’ve come up with an under five minute routine for those nights where you just want to curl up in bed and not have to worry about skincare! Make sure you take off your makeup. It seems like so much effort when you’ve just spent the past four or five hours out, but its important, your skin just wouldn’t appreciate you falling asleep with it on. Anyway, since this is a quick and easy routine I’d recommend just using face wipes or a micellar water. Boots Makeup Remover Wipes work pretty well or the Garnier Micellar Water is incredible too! Now all your makeup is removed, we’re going to skip cleansing. After all this has to be quick so you can jump into bed. I would never normally skip cleansing because I think its important but however, I introduce Lush Tea Tree Water. I’ve harped on about this far to much, but its amazing. Just spritz this all over your face and you’ll feel a lot more refreshed and clean. This is great because as its got tea tree in it, its going to act as an anti bacterial for your skin. You’re probably going to want to give your skin a quick bit of moisture before you hop off into bed; I love using the Boots Botanics Mattifying Gel Cream because it sinks into the skin quickly but moisturises at the same time. It feels fresh on the skin and has a light scent to it. Also keeping your skin nice and matte! Finally we’re almost there, this step isn’t that important but if you’ve been suffering with a few breakouts and spots you might want to include this step to keep them at bay. 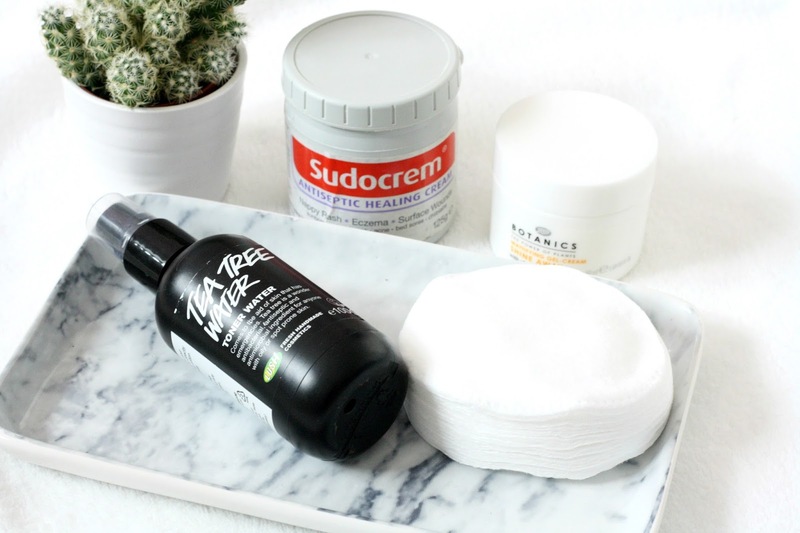 I use Sudocrem on anywhere that is problematic or I have a spot. It almost dries out the spot, reduces its size and redness. This is a really quick and easy fix, so if you still want to take care of those troublesome spots then this might work for you! What are your favourite quick and easy skincare products?